T-shirts are easy to come by and they make fantastic raw materials for a variety of craft projects. These no-sew ideas will have you adding style and functionality to those old boxy T-shirts without having to break out your sewing machine. If you love upcycling, these ideas are for you. Give that style-challenged T-shirt a feminine and flirty look with this easy project. 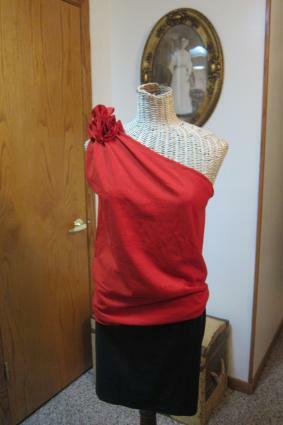 You can make it in any color, but the rose on the shoulder looks fantastic in shades of red or pink. This project will take you about an hour and a half, including drying time for the fabric glue. 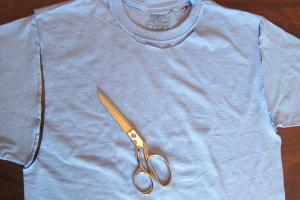 Place the T-shirt on your work surface and cut off the sleeves and neck. Cut through both shoulder seams. Try on the T-shirt. Allow one shoulder to flop open and pull up on the other shoulder to adjust the fit. Use a safety pin to temporarily hold the adjusted shoulder the way you want. Take off the shirt. Cut a strip of extra fabric from one of the sleeves and tie it around the shoulder where you placed the safety pin. Remove the safety pin and add a dab of fabric glue to secure the knot you made. Trim off the excess fabric from the shoulder you dropped, leaving about an inch. Run a line of fabric glue along this edge and fold it over to create a finished look, like a hem. Allow the fabric glue to dry. While the glue is drying, spread out your scraps of excess T-shirt fabric. Place a round object, ideally a glass about three inches in diameter, on the fabric. Use the disappearing pen to trace around the object. Make at least six circles, and cut them out. When the fabric glue is dry, you can then create the rose for the shoulder of your shirt. Fold each circle in half and then in quarters. Apply a bit of fabric glue to the folded corner. Press the corner into the shoulder of the shirt. Arrange all the circles this way, just below the knot you made to secure the shoulder, so they form a rose shape. Allow the fabric glue to dry for at least half an hour before trying the shirt on. There's no rule that says T-shirts need to be worn on the top half of your body. You can easily turn a basic T-shirt into a mini-skirt that you can pair with any top you like. This project takes about an hour, including drying time. Place the T-shirt face-up on your work surface. 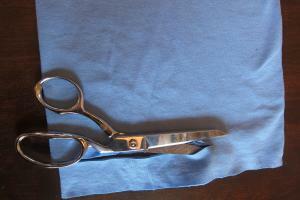 Use the scissors to cut about two inches up the arm seam on each side. Cut all the way across the chest to separate the T-shirt body from the chest and sleeves. Set the chest and sleeves aside for another project if you desire. Protect your work surface with a plastic bag or drop cloth. Turn the T-shirt body inside out and lay it on the surface. Run a line of fabric glue across the top raw edge, keeping the glue right near the place where you cut. Fold the edge back against the rest of the T-shirt body, creating a channel. The ends will remain open. Repeat this process with both sides of the shirt. Allow the fabric glue to dry for at least half an hour. While the glue is drying, wrap the elastic around your waist and add about an inch of extra length. Use the scissors to cut the elastic at this point, and poke a safety pin through one end of the elastic. Once the glue is dry, use the safety pin to guide the elastic through the channel you made with the fabric glue. 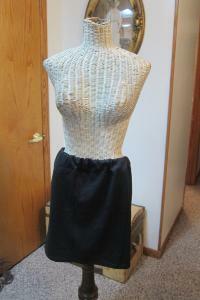 Go through both sides of the skirt, allowing the fabric to gather along the elastic. When the elastic is all the way through the skirt, remove the safety pin. Apply some fabric glue to one end of the elastic and stick the other end to it. Use the safety pin to hold the ends together while the glue dries. Once the glue is dry, remove the safety pin and enjoy your new skirt. Making a T-shirt scarf is incredibly easy, and you can add visual interest by finger crocheting a part of the T-shirt material. Make several of these pretty accessories with plain and patterned shirts to create a variety of different looks. 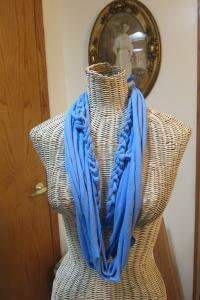 You can make this scarf in about half an hour. Start by cutting off the sleeves, bottom hem, and collar of the T-shirt. Discard these pieces or save them for a different project. Fold the T-shirt in half lengthwise and begin cutting across the body portion to create strips that are about an inch wide. You'll need at least 10 strips. When you reach the arms, stop. Pick up one strip and stretch it out to make a long loop. Run it through your hands several times to make the edges roll in. Repeat with the remaining strips. Stack the loops together, but set four loops aside for the crocheted part. Cut these four loops to create long strings. Tie a looped knot in the end of the string and bring the string through the loop to create another loop. Repeat this process to finger crochet the length of the string. When you reach the end, tie on the next string. Keep going until you've used all four strings and the crocheted part of your scarf is the same size as the other loops. Tie the ends together securely. Cut a small piece of fabric from the remaining portion of the T-shirt. Use this to tie the loops of the scarf together. While sewing is fun, it isn't always easy or practical to haul out your sewing machine. If you want to create a few great no-sew projects without spending a lot of money, upcycle a few of those oversized T-shirts you have around the house. All it takes is a little time to add some extra style to your wardrobe.